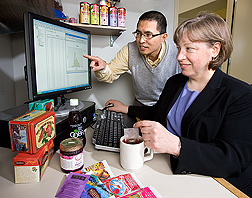 Antioxidants Research Laboratory scientists Diane McKay and Oliver Chen discuss the results of their hibiscus tea study, which showed the effectiveness of this beverage in reducing blood pressure. These days, there is a lot of talk about health benefits from drinking teas. Green, black, and oolong are considered the three major classes, and each comes from the age-old Camellia sinensis tea bush. But there is an even wider variety of herbal teas—infusions derived from anything other than C. sinensis. According to folklore, some herbal teas also provide benefits. But there is little clinical evidence on the effects of drinking these teas. Now, Diane McKay and Jeffrey Blumberg have looked into science-based evidence of health benefits from drinking three of the most popular herbals in America. McKay and Blumberg are with the Jean Mayer USDA Human Nutrition Research Center on Aging at Tufts University in Boston, Massachusetts. Both work at the center’s Antioxidants Research Laboratory, which Blumberg directs. They did, however, publish a review article on findings far beyond sedation—describing test-tube evidence that chamomile tea has moderate antioxidant and antimicrobial activities and significant antiplatelet-clumping activity. Also, animal feeding studies have shown potent anti-inflammatory action and some cholesterol-lowering activity. McKay has led a human clinical trial to test whether drinking hibiscus tea affects blood pressure. She tested 65 volunteers, aged 30 to 70 years, who were pre- or mildly hypertensive. Blood pressure readings of 120/80 or greater are considered a risk factor for heart disease, stroke, and kidney disease. For 6 weeks, about half the group was randomly selected to drink 3 cups of hibiscus tea daily. The others drank a placebo beverage containing artificial hibiscus flavoring and color. All participants were advised to follow their usual diet and maintain their normal level of activity. Before the start of the study, blood pressure was measured twice—1 week apart—and at weekly intervals thereafter. The findings show that the volunteers who drank hibiscus tea had a 7.2-point drop in their systolic blood pressure (the top number), and those who drank the placebo beverage had a 1.3-point drop. The 2010 study was published in the Journal of Nutrition. “This data supports the idea that drinking hibiscus tea in an amount readily incorporated into the diet may play a role in controlling blood pressure, although more research is required,” says McKay.—By Rosalie Marion Bliss, Agricultural Research Service Information Staff. "Reading Herbal Tea Leaves: Benefits and Lore" was published in the March 2011 issue of Agricultural Research magazine.